As Christmas and New Years holidays are creeping in many people tend to ask me about the types of dishes served in a typical Bulgarian household during these holidays. So I thought there's no better way to describe our dishes than a picture. Unfortunately, those are not mine but Google-sensei was happy to provide. Many people seem surprised when I tell them that Christmas dishes are vegetarian. Bulgarians are in no way vegetarian - this is a tradition dictated by religion. 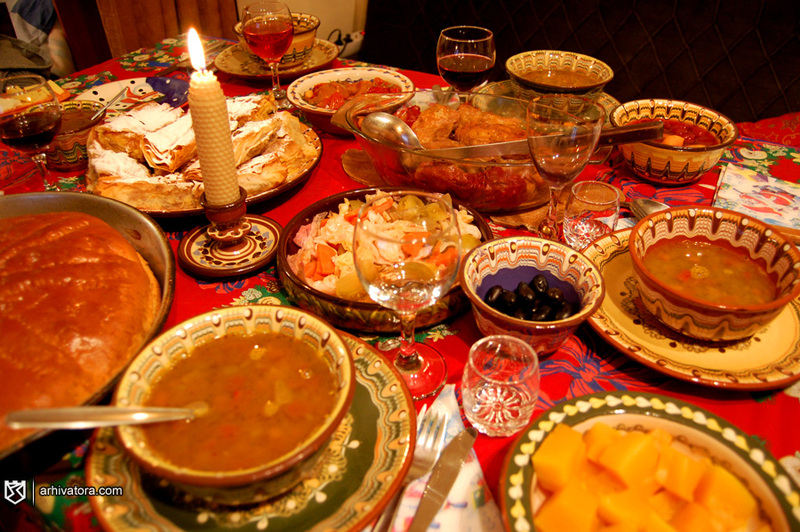 In eastern orthodox Christian countries, Christmas dishes are vegetarian (we tend to overcompensate on New Years, however) because Christmas night is the last day of Christmas fasting. So here are some dishes (I'll try to explain what they are, rest assured all are delicious). From bottom left to right we have: "pitka" - a type of bread, usually with a coin inside. Whoever gets the coin gets good luck for next year (never bite too hard :)). Next we have a bean soup with mint, followed by boiled pumpkin. In the center we have pickled cabbage, carrot, cauliflower salad. On the top left to it we have pickled whole red peppers with garlic. The big dish to the right is stuffed peppers. The last dish on the left is a desert. There you go, my mouth is already watery from looking at this picture. Hello again! It's that time of the year again! No, not talking about Christmas, probably you have already heard so many stories about Christmas so I won't bother you with any of that. Instead I want to tell you that I made progress making my bass guitar again! Small progress but progress nevertheless. 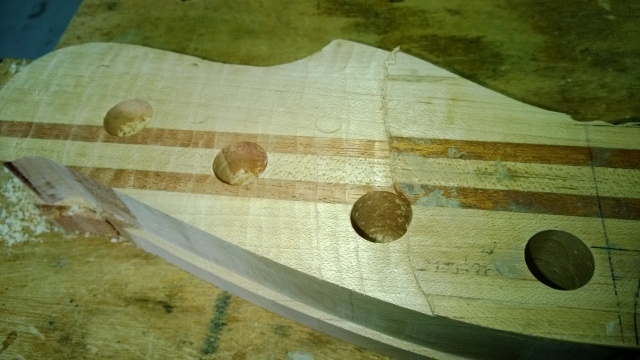 I managed to drill holes for the tuners after a quick stop at Homac for a drill bit. 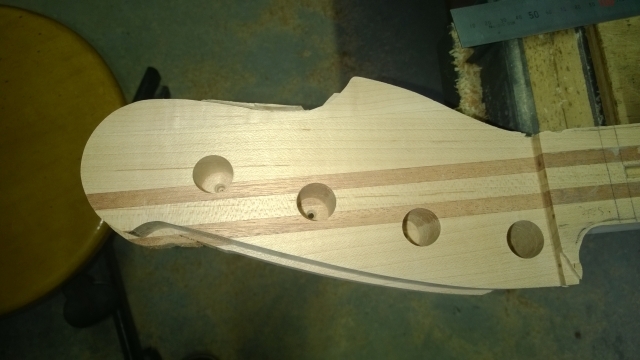 Also I started to make the headstock thinner but still plenty of work ahead of me. Next I have to but a 10" radius sanding block to prepare the fretboard but before that I have to make the slots for the frets and put in the inlays(mexican abalone). But allthis after Christmas because it's the season to just take it easy and enjoy good food, friends and family. Remeber to be nice to people and pets because Santa Claus is coming to town! It’s time for another of my curiously focused blog topics. This time, I thought I’d touch on what I like to call “the gaijin glare”; a certain contemptuous look we foreigners exchange when stumbling upon one another in public while living here in Japan. First, I should disclaim that while most do, not all foreigners participate, and for those who do, the internal feelings are subject to vary per person. However, in my experience, and according to extensive discussion with other English-speaking foreigners living here, it appears to be a pretty ubiquitous phenomenon. That said, I can only offer my personal perspective along with those of people who I’ve discussed this with. Luckily, they mostly seem to jive. The best way I can explain the gaijin glare is by painting a mental picture: if walking in public—such as a park, train station, pedestrian crossing, or shopping area, and I suddenly come upon another foreigner, the first step is to make a snap-judgement about their appearance, while also making several (often derogatory) assumptions about them and their circumstances. Step two is to stare as long as possible in effort to continue visually gathering information…until they notice me or accidentally make eye contact. It is within this fraction of a second while making eye contact that we both exchange “the glare”; and just like the tremendous amount of information included in each dolphin’s squeal or a cricket’s chirp, we also transmit a flurry of data. Step two requires a bit of explanation. We don’t really hate one another or harbor any actual resentment, yet the thoughts that course through our minds might make you believe otherwise. I may start by thinking, “Wow. Look at that guy. Must think he is SOOO cool; a foreigner in Japan. I’m so impressed. What a tool.” Note that the previous sentence is rife with sarcasm, and properly sanitized of its vulgarity for this blog. The obvious hypocrisy is not lost on me, either. Following that, things escalate to near wild animal-levels of territorial defense: “I don’t know you, and I don’t want to. I don’t even care where you’re from; just go back to wherever it is you came. This is MY exotic foreign experience, and here you are, stinking it up. Get lost.” Think of a single fingerprint on an otherwise pristine mirror, or a long black hair in your white soft cream (more like a dog’s yellow stain marring the foot of a fresh snowbank); it’s as if the other foreigner’s mere presence is an unforgivable trespass against some kind of fantasy of a fantasy we possess about a lifestyle in Japan, and we want nothing more than to completely erase this person from existence in this moment. This brings us to the third and final step, which after the split-second previous step, is a repulsion of our glances like polar-opposite electromagnets. As much as we want to continue our perverse surveillance, we must completely ignore one another at all costs until we’ve passed or are no longer in danger of having our scenic Japanese vistas—even those of ordinary daily minutiae—spoiled. It’s in this period of willful non-contact that the thoughts and sensations transmitted during the glare begin to set in and the oddity of the whole experience brings a tinge of guilt for bearing such malevolence toward an innocent stranger. An interesting observation is that this generally only applies to individuals; not people at our offices or international parties, nor to groups or couples, even mixed couples. I’m sure a whole separate glare exists for that. 'Ski is easier to start with and harder to master ; snowboard is harder to start with and easier to master"
This is what I've heard from different friends since I'm in Japan. I don't know to what extent it's true, but what I'm sure of is that my bottom is happier with ski! About a year ago, for Christmas, I was jumping on a snowboard for the first time and I must say that I spent more time in the snow than on the board at the time! After one day using my poor little bum as a pillow, it took me a good week to sit down normally again. This year I tried ski for the first time and my bottom stayed quite happily safe and sounds! Mind me, what makes me like ski better than snowboard so far is not the safety of my bum actually but the fact that I could master how to stop faster than when I was on a board. Though I still think that snowboard is way cooler! I came to think about these experiences as challenges and this is what I've been wondering since : Do I prefer to try something easy to start with and harder to master or the opposite? That is a good question indeed... I gotta think about it! What about you guys? What would you rather go for? Easy start, harder mastering or easy mastering, harder start? Until next time at the cafe!